The fun in discovering new places is also the excitement of trying out new stuff. Be it a dish or an attraction, some things are just location-specific. It turns out some modes of transportation are just as unique. We talked about the most amazing cable car rides in the world. We mention the funicular when exploring Quebec City. You knew the famous New York yellow cabs, now here are seven other public transports to try during your next travels. Looking for a cheap yet awesome way to cross the Grand Canal? Until the 20th century, there was only one bridge crossing the canal. And if you were too far away from it, the fastest way to cross was to head to a nearby Traghetto pier. Nowadays, there are four bridges and the water buses (vaporetto). Still, a gondola ride remains a popular and cheap mode of transportation in Venice. It sorts of takes the romance out of it but hey! a gondola ride is a gondola ride. Believe it or not, the Filipino most famous public transport modes owns a lot to Americans. In fact, these are WWII army Jeeps, pieced together, and redecorated. They are each as unique as they can, with their own paint patterns and names. You will see them blaze through the city streets at breakneck speed, often overcrowded. Also their old engines might even contribute to air pollution, but they are full part of the adventure. 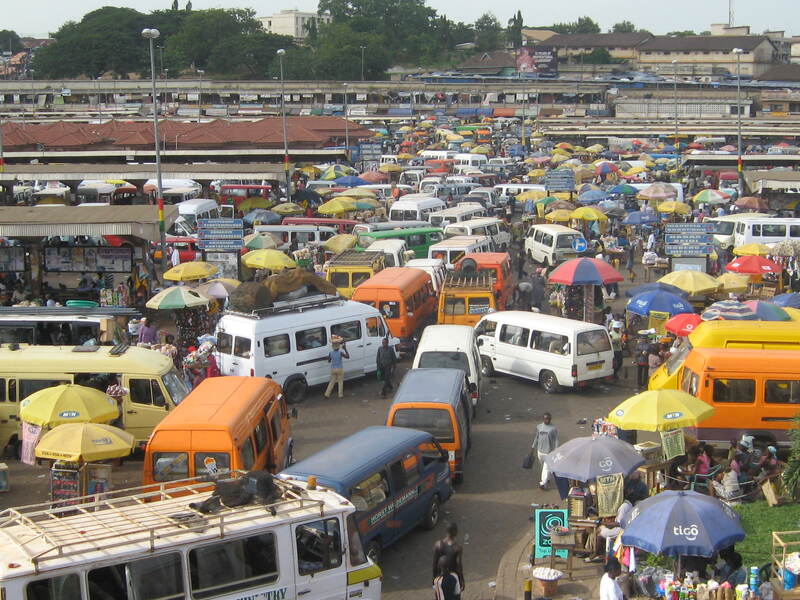 We mentioned Ghana’s capital, Accra as one of the booming African cities to visit at all costs. Well, when you visit, you will see that Accra has its own type of Jeepney. Just like the Filippino jeeps, they are richly decorated, with sayings and slogans. Tro tros are the kings of Ghanaian roads, in numbers and in recklessness. But unless you want to cash out for a rental, in some places, they will be the only mode of transportation around. Beware if you try to get around in a tro tro. You have to be sharp as these buses never completely stop to pick up or drop off passengers. The roof is often packed with baggage, livestock, and even people at times. Something you must see to believe. For a long time, these toboggans were the preferred downhill mode of transportation in Funchal. Nowadays, it is more a tourist attraction but they are still worth the ride. These wooden runners are driven by two men in all white with rubber black shoes that they use to brake. The 1.2-mile ride will take you from the Nossa Senhora do Monte Church down to Livramento suburb. Many see this as a “must-do” on the Madeira island. Admit that it is not something you could do every day. In Peru, there is a unique and beautiful way to cross the Titicaca Lake. The Uros use dried reeds to make these incredible boats. These traditional modes of transportation are still in use nowadays to explore the lake and its surroundings. An elephant back ride used to be a royal mode of transportation. Nowadays, the pachyderms carry around loads of tourists instead of the local aristocracy. The howdah themselves – thrones- vary from the most simple seats to the most luxurious carriages. The bamboo train is exactly what is sound like: an improvised rail vehicle made of bamboo. The platform is powered by small motors that can propel them up to 30 mph. However, things can get a little bumpy due to frequent derailment and breakdowns along the crevasses along the ride. Which of these crazy rides have you tried or would you love to try. Got more unique modes of transportation you would like to add to this list? Add to the discussion in the comment box below.